From the authors of the breakout bestseller All my friends are dead. 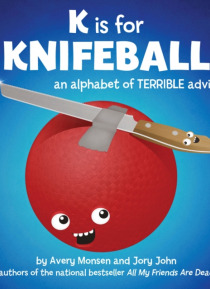 and in the humorous vein of Go the F**k to Sleep comes a laugh-out-loud collection of bad advice that turns the children's alphabet book on its head. Adorable illustrated characters lead readers down a path of poor decision-making, and alphabetical, rhyming couplets offer terrible life lessons in which O is for opening things wit… h your teeth, F is for setting Daddy's wallet on fire, and R is for Raccoon (but definitely not for rabies). With plenty of playfully disastrous choices lurking around every corner, this compendium of black humor may be terrible for actual children, but it's perfect for the common-senseless child in all adults.